Poll results: Android customization – how far do you go? How far do you go when talking Android customization? That's what we sought to understand on Monday, and thousands of you spoke up. With the Christmas celebrations now dying out and giving way to the emotional vacuum typically reserved for the remainder before New Year's Eve, it's time we revealed the results. By and far (55.93%), those that chose to take part in the poll are no joke when it comes to customizing their Android-touting handset and go full out – from the wallpaper and ringtone, down to the icon pack and lockscreen. Of the remaining 44.07%, a quarter limit their adventures and keep it simple with a background switch here, and a new rintone there, while the rest (18.73%) choose to delege this otherwise manual work to a third-party launcher, many of which offer customization in a number of areas. While we can't claim to have a representative data set to argue that most of our viewership is very much making use of one of the very core building blocks of Android – the ability to tweak the experience user significantly – we could say that there's a very serious core within it that absolutely does. And that's nothing short of wonderful. Poll: Android customization – how far do you go? I used to but then I got the Nexus 5. Didn't really seem necessary. Been looking at getting into that game again. Fun stuff. Dude, that's half the fun of owning a Nexus. I know. It was one of the reasons why I bought it. When I first got it though I was at Tech school(Air Force) and didn't have my computer with me so I just made due. I'll get there soon. On every single device i had i used at least 50 Custom roms , why buy a 300+$ Euro device if you cant have a little fun :D Most fun i had with my S3 , damn those were good times from 4.0 to 4.4.4 , from s4 to note 2 to s5 to note 3 to note 4 roms on my S3 , pure awesomeness! I used to use custom ROM's because of the slow updates phones were receiving due to carrier certification. Now that has been a bit more streamlined I rarely use them. Now I will say if I can find a reasonably priced Xperia Z1 or Z3 Compact I'll go back to ROM's. Mainly because of Sony's open support for AOSP. Just be aware that if you unlock the bootloader on those Sonys (required to flash recovery and SuperSU for root), it deletes the proprietary DRM keys, and you can't get them back. That means all their special audio and video enhancements, as well as camera performance. No big deal if you don't plan on going back, but a bummer for people like me who would love a rooted Z3C with stock ROM and all the fancy Sony enhancements. That'd be the perfect daily driver phone. PA should do a poll to see what % of people root their Androids and/or jailbreak their iProducts. Obviously it wouldn't be representative of the general public, since everyone who frequents PA, regardless of their preference of OS, is an enthusiast and "power user". AOKP Rom was my favorite. Then Padawan. I was using those on my Galaxy Note. I would be such a boring Android owner..... While I respect how much you can do with Android, if I were to make the switch it would be to a device that pretty much works the way I want it to when I get it. A Nexus or a very lightly skinned Android is the best for me. Then I would most likely set it up once and roll with it for as long as I owned it except for that "ring tone/wallpaper" change here and there. Yep... boring. I don't se the point of changing ROM-s I have a Nexus 4 with stock lollipop and that is all I need baby ;) I don't even use half of features that I could do. When you have a family then your time spend with your device is limited. I build my own roms :-) was the first to port CM11 to Samsung S Tab 10.5" this is the ultimate customisation, cherry pick all the features that you like and build the dream rom. Cool. I need to spend a few weeks reading everything in the Android Kitchen and learn how to cook ROMs. A little SlimKat here, a bit of OmniROM there, CM's theme engine, slather in some Paranoid Android...everything I want, nothing I don't. Nexus 5 AOSP 4.4.4 + root + xposed + gravity box + xgels + some other modules and root apps = pure awesomeness for me. All the above posts are a perfect example of why Android is so awesome. And why I love it. Not really one of them matched, from doing nothing running it pure stock, all the way to building your own ROM. Or even downloading a ROM Then loading up on xposed and root apps. The beauty is you have CHOICES!!! 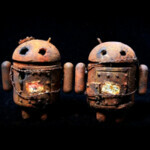 The new Android commercials show it well.. WE ARE ANDROID!!! Android without root is like a cheeseburger without bacon. Sure, it's good, but it could be so much better. not surprised as expected. I customize my android in the way that nobody would know it =DD hahaha. I love how it appears to be my only phone. Even somebody who is familiar with android will be confused using it the first time. Look at Iphone, every one is the same, boring !